Moist. Woodland edges, stream sides. Full to partial sun. This is a 1½′ to 10′ tall, erect, perennial forb that rises on one or more stems from a fibrous roots and a horizontal, underground, somewhat woody stem (rhizome). It often forms colonies. 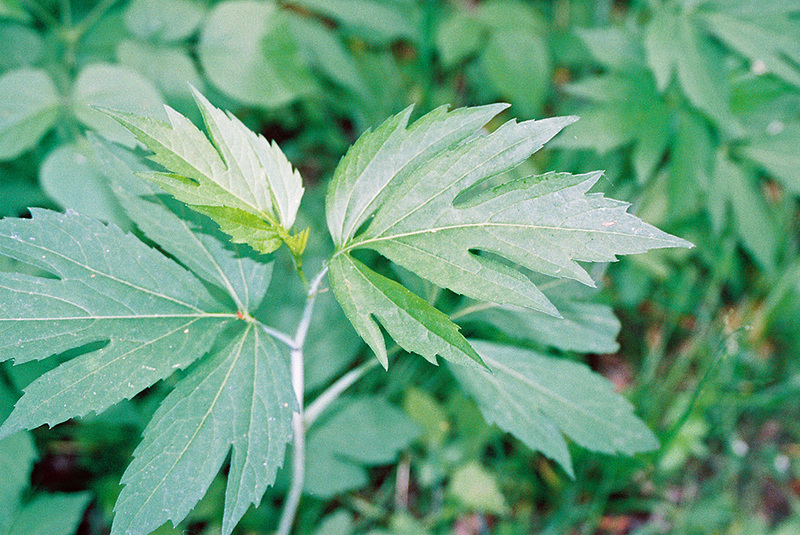 A single stem or multiple stems rise from a rosette of basal leaves. 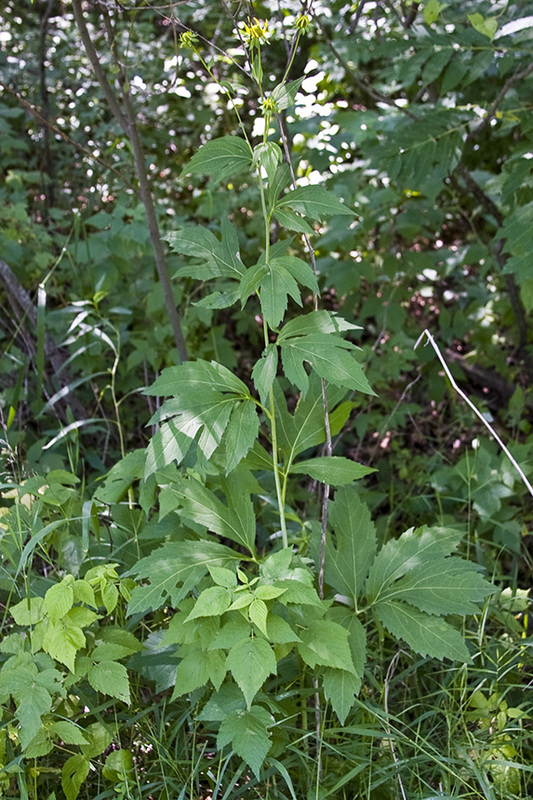 The stem is erect, round in cross section, ridged, unbranched below the middle, and branched toward the tip. It is hairless; light green, bluish-green or purplish; and usually covered with a whitish, waxy coating (glaucous). 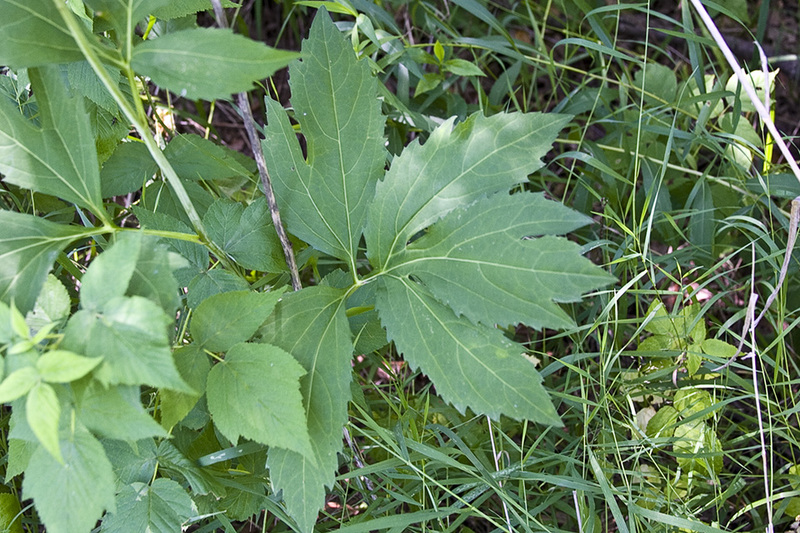 Stem leaves are alternate. 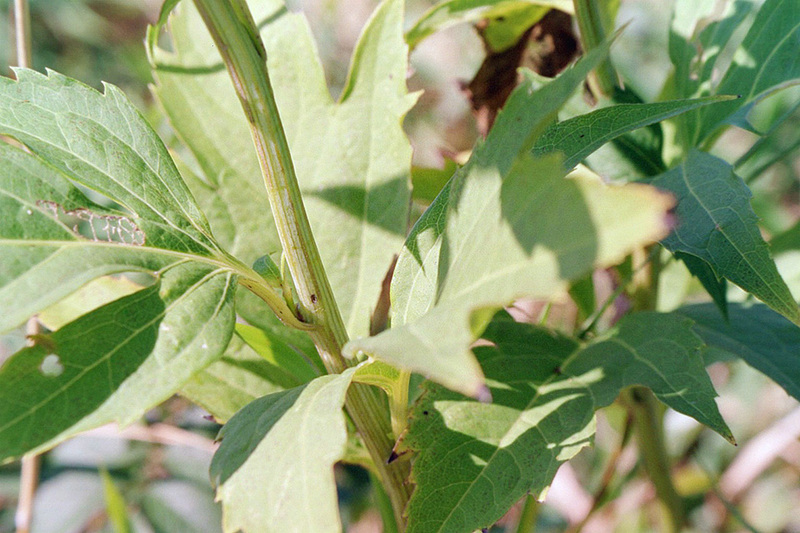 Basal and lowermost stem leaves are on long leaf stalks. The leaf blade is egg-shaped to broadly egg-shaped in outline, 6″ to 20″ long, and 4″ to 12″ wide. It is either deeply lobed (pinnatifid) with 3 to 7 lobes, or pinnately divided into usually 3, sometimes 5 or to 7, leaflets. The lobes are egg-shaped to elliptic or inversely egg-shaped and tapered to a sharp point at the tip. On both divided and lobed leaves the terminal leaflet is usually deeply divided into 3 lobes. The terminal lobe is shallowly, symmetrically lobed. The upper and lower surfaces are hairless or sparsely covered with short, stiff hairs and are also sometimes somewhat glaucous. The upper surface is smooth to the touch. The margins of the ultimate lobes and leaflets are untoothed, finely toothed, or coarsely toothed. 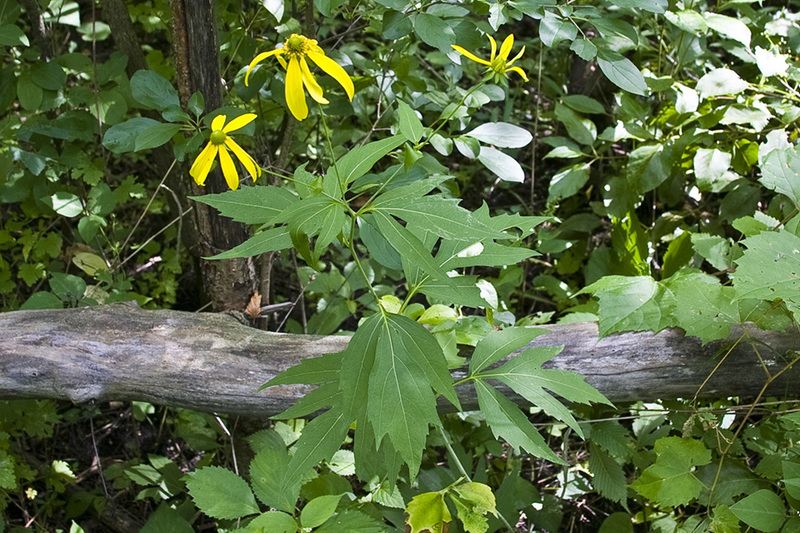 The leaves become smaller, shorter stalked, and less divided or lobed as they ascend the stem. 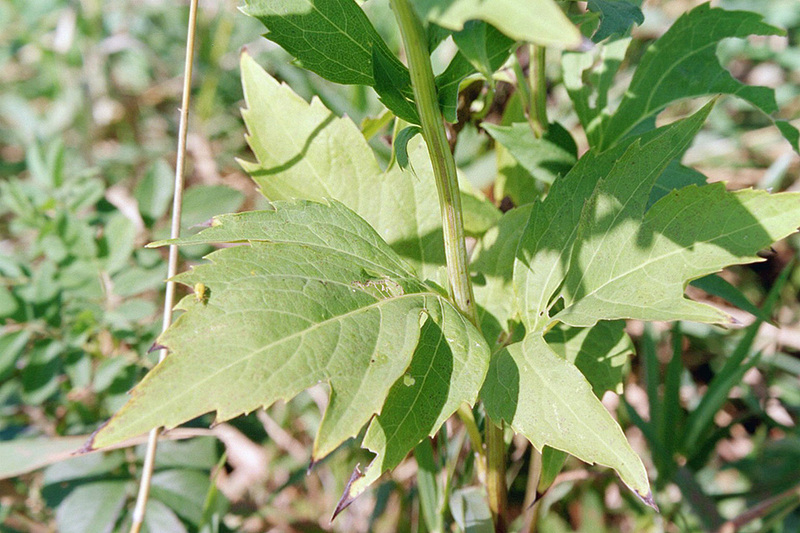 Middle and upper stem leaves have 5 to 9 lobes. Middle stem leaves are 3″ to 16″ long, and 1¼″ to 8″ wide with lance-shaped to egg-shaped or elliptic lobes. 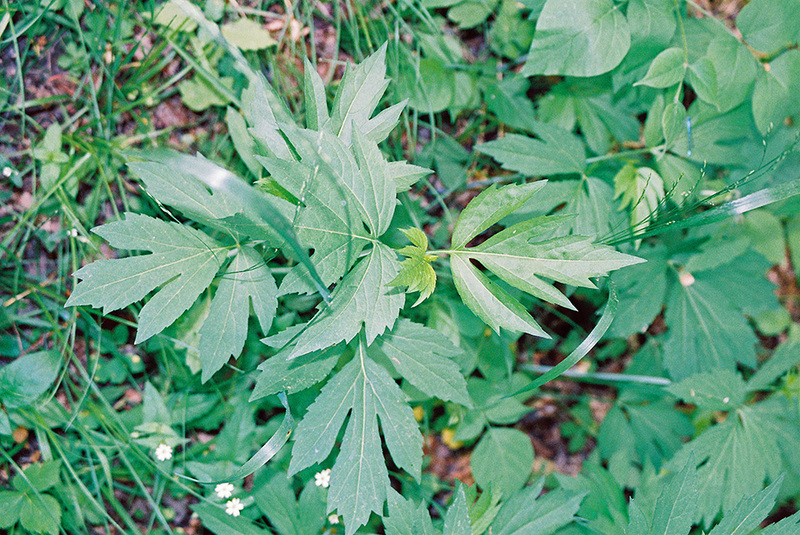 Upper stem leaves are unlobed or divided into 3 lobes and are sometimes unstalked. The inflorescence is a leafy, loose, flat-topped, corymb-like array of 2 to 25 flower heads at the top of the plant. 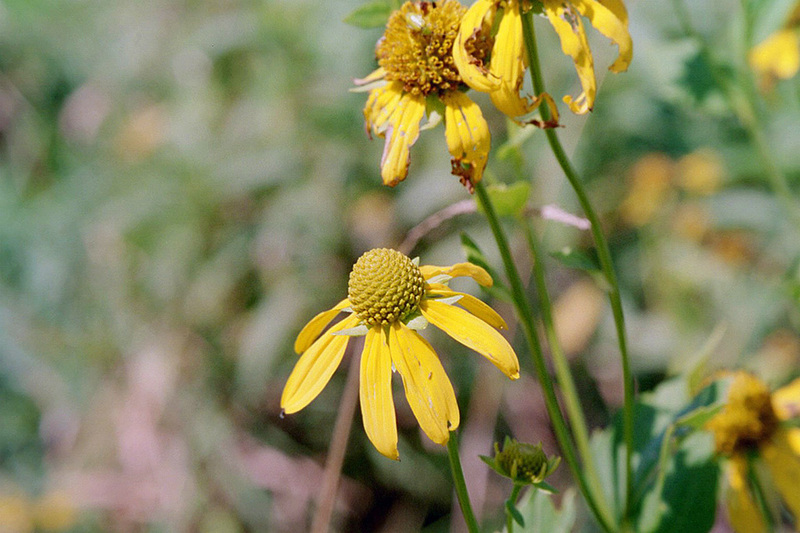 The flower heads are showy and up to 3″ in diameter. 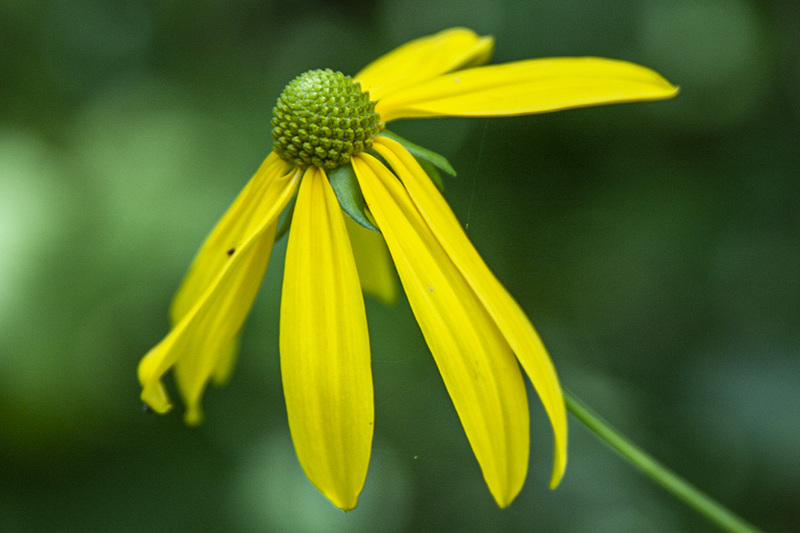 The whorl of bracts at the base of the flower head (involucre) is ⅝″ to 13 ⁄16″ in diameter and narrowly saucer-shaped, more or less round with a shallow depth. It is composed of 8 to 15 bracts (phyllaries) in 2 overlapping series. The phyllaries are egg-shaped to lance-shaped and up to ¾″ long. The outer surface and the margins are sometimes hairless but more often moderately to densely covered with fine hairs, especially toward the base. The flower head has 8 to 12 ray florets and 150 to 300 or more disk florets. The ray florets are yellow, ellipse-shaped to inversely lance-shaped, ¾″ to 1¾″ long, and ¼″ to ⅝″ wide. They usually angle downward, sometimes droop downward, at the base of the receptacle. The receptacle is egg-shaped to globe-shaped, ⅜″ to 1″ long, and ⅜″ to ¾″ wide. It is covered with disk florets. The disk florets are ⅛″ to 3 ⁄16″ long and dull yellow to yellowish-green, with yellow lobes toward the tip. The fruit is a dry, one-seeded, ⅛″ to ¼″ long seed capsule (cypsela). The tip of the cypsela is flattened and has no hairs but a low crown. Was at the Old Treaty Crossing Festival Huot MN today. 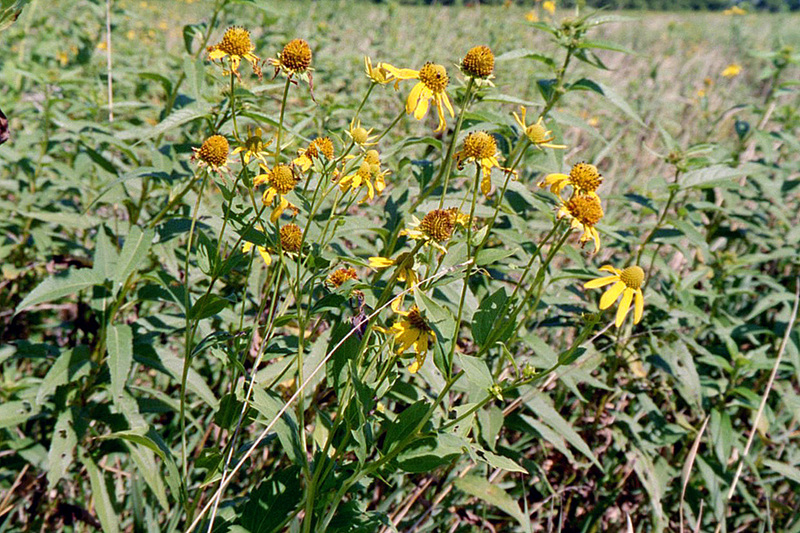 Came across a large patch of Cut-Leaf Coneflower which all abuzz with Honey Bees and Tricolored Bumble Bees.